Eyes beat memory according to Tamara Munzner. Her idea (which she shares with others, including myself) is simple. It’s easier to compare two things you can see at the same time than to compare something you can see to something you can only remember. When several small visualizations are placed side by side (called “small multiples”), you can see the power of eyes over memory. Take a few seconds to check out this great small multiples viz by Doug McCune. You can quickly scan the images to make easy comparisons. In each chart, the X-axis shows time of day, and the Y-axis shows number of crimes. 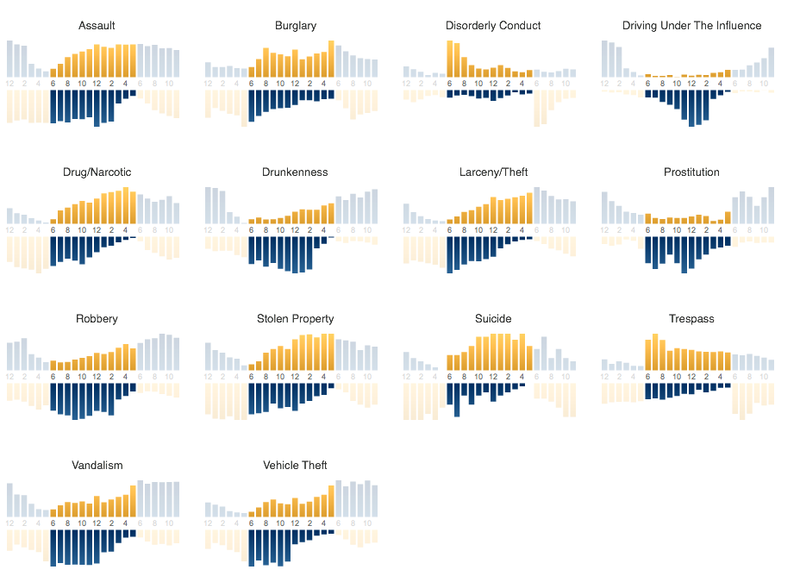 Daytime crimes are displayed with yellow bars in the top half of the chart. Night-time crimes with blue bars on the bottom. It’s easy to see that driving under the influence and drunkenness occur more often during the night and trespassing and suicide occur more often during the day. It would be much harder to draw this conclusion flipping through pages or clicking through screens.